PHOTO BY JILL GOSCHE BJ Ford holds Calypso, a barred owl, at the Wyandot County Fair Thursday afternoon. UPPER SANDUSKY — A couple is providing educational programming about birds to those attending the Wyandot County Fair this week. BJ Ford and his wife, Angie, have operated Wind Beneath My Wings raptor education programs for about six years and can present information to school and youth groups and county events, such as the fair. Ford said Angie is the leader of the effort. They don’t own the birds and do not do rehabilitation, he said. They have birds that already have gone through the rehabilitation process but are not well enough to be released into the wild to care for themselves. 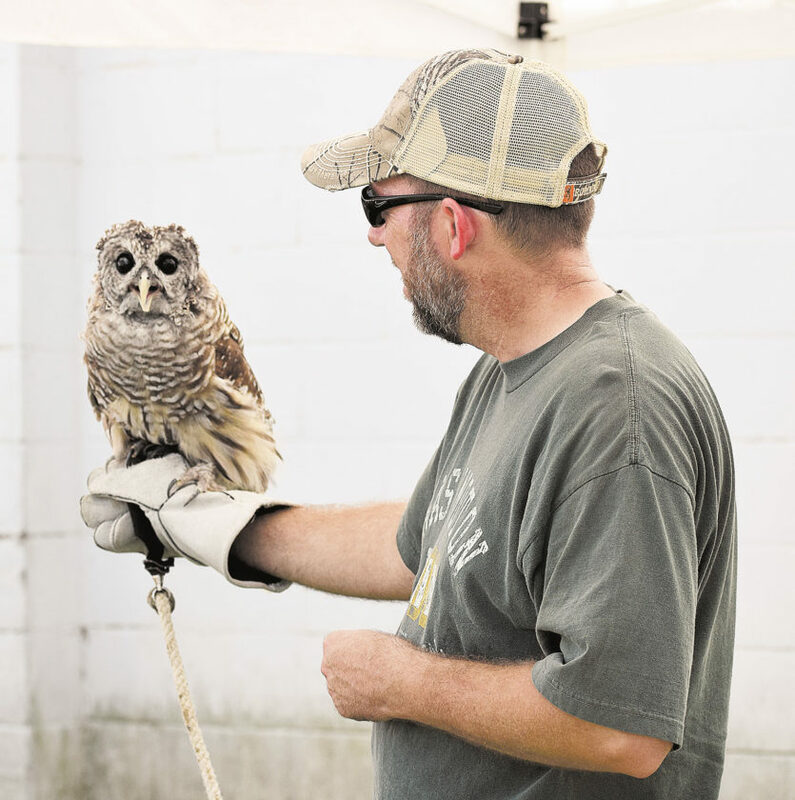 Ford held Calypso, a female barred owl, for people attending the Wyandot County Fair to examine Thursday. The barred owl is the second-largest nesting owl in Ohio, he said. Calypso suffered permanent wing damage and cannot fly well, Ford said. “She was hit by a vehicle,” he said. Calypso is going through a time of molting. “This isn’t a pet. … We just have her (here),” he said. A Findlay-area couple previously operated Wind Beneath My Wings and retired. Ford said he and his wife went through training and started with three birds. An old screech owl died in the spring, and a Harris hawk is retired from participating in educational programming. The programming is a neat hobby, Ford said. Wind Beneath My Wings is to be at the fair 4-8 p.m. today.